It is a well known fact that keyboard shortcuts can help us a lot while developing, especially when you have a lot of code to go through and you have to find the opening and closing brackets or insert a new widget or remove one. Time is precious and I find these shortcuts help me a lot in coding in flutter. I became a fan of VS Code mainly because it’s so light weight and opens much faster than other IDEs I have worked with and have a ton of features and customizations along with extensions which can do wonders (This is just my personal opinion). If you use Android Studio and IntelliJ in Windows, I would recommend you to read this great article or if you use mac you can check out this article. First of all I hope you have Dart and Flutter Extensions enabled, if not you can get them from here : Dart and Flutter. Now let’s jump into the shortcuts and see what all wonders we can do. Firstly, I will provide you the shortcut to get all the shortcuts. Or you can also use Ctrl+Shift+P to Show Command Palette with the recently used commands or also to search commands. Or you can take a printout of all the default VS Code keyboard shortcuts from here. You can get the official dart custom shortcut list from here and flutter vs code extension documentation. While coding, this is one of the important tools especially for beginners or if you get stuck somewhere and want to check for options, you can use Ctrl+Space to get a list of curated code completion options. As you can see below, when on any widget you can click Ctrl+. to find the quick fix options. You can extract an existing widget and make it a local variable and magically the widget will be replaced by the variable, wherever it is used. What if you have got a lot of code and you want to split it to different methods. It would even given you a generated name for whatever code you want to split. But I would advice against splitting widgets to methods, instead you should create a new class as it has a lot of impact on performance, you could refer this article to know in depth why widgets should not be split into methods. You can do this easily using the next menu. This can come a lot in handy if you want to split your widgets into smaller widgets. Hope by now you know about the importance of splitting widgets to smaller widgets and it’s impact on performance 😉. Just click on any widget and then click Ctrl+. and click Extract Widget option and give a name for the new widget and click Enter and that’s it. Adding padding to an existing widget is much more easier with the quick assist tool, just select Add padding and you will get padding around your widget without messing up your widget structure. This is used to wrap it with a center widget, thus centers your widget. You can use this same technique to wrap your required widget with a Column or Container or Row or StreamBuilder or any other widget or even custom widgets, to make that as your parent widget of the required widget. But, unlike the same tool in android studio, you cannot select multiple widgets to come under a column, as of now that feature is not available. There are some flutter specific shortcuts as well, which will provide some boilerplate code to work upon, which you can call by typing prefixes, in case the menu doesn’t popup you can type Ctrl+space after typing the prefix. Prefix stless: Create a new subclass of StatelessWidget. Prefix stful: Create a new subclass of StatefulWidget and it’s associated State subclass. Prefix stanim: Create a new subclass of StatefulWidget, and it’s associated State subclass including a field initialized with an AnimationController. Inorder to see the class hierarchy press F4 on any widget and in a few seconds you will be able to see the widget hierarchy. This is very common and is used usually in any editor, you can select any word by double clicking the left mouse button over that word and you can select the whole line by clicking the left mouse button 3 times consecutively. You can easily see behind the curtains of any widget and know it’s working or even find out the reason behind your errors or find the required parameters by going to the widget source code and reading about it, flutter provides a detailed documentation in the form of comments in the source code and can help you solve issue faster, in order to do that, it’s very easy, you just have to press ctrl and then left mouse click any widget to go into its source file, or you can use F12 while cursor is on the widget. You can cut a line by using Ctrl+x or copy the line using Ctrl+c when the cursor is at any point on the line and then you can use Ctrl+v to paste the same. You can directly go to any line number by using Ctrl+g and typing the line number. You can move a single line by clicking anywhere on the line and then clicking Alt+↑ or Alt+↓ you can move the line one line up or one line down. Or you can move a whole selection in same way. Similarly you can use Shift+Alt+↑ or Shift+Alt+↓ to copy a line/selection of lines up or down. Sometimes while we are coding and traversing through different files or implementation, we might forget how we reached to this exact code. You can easily trace your steps by using Alt+← to see which all code you had come through to get here, you can use Alt+→ to go forward as well. You can easily switch between open files / tabs using Ctrl+Tab and then if you hold down Ctrl and keep pressing Tab you can choose which tab you want to traverse to. Writing efficient code is difficult and usually it ends up being messy with the usual time constraints and hence before pushing the code to git or any other versioning tool, you would want to clean it up and make it look good with good amount of comments so that it is well maintainable and for that here are some of the keyboard shortcuts which would come in handy. Now you can easily format this by pressing Alt+Shift+f to fix your indentation and reformat code. PS:- Always put trailing commas to get this formatting to work accordingly. You can comment any existing line by pressing Ctrl+/ , you can use the same command to un-comment existing comments. These are some of the debugging shortcuts which will come in handy, hope you don’t need any examples for the same. 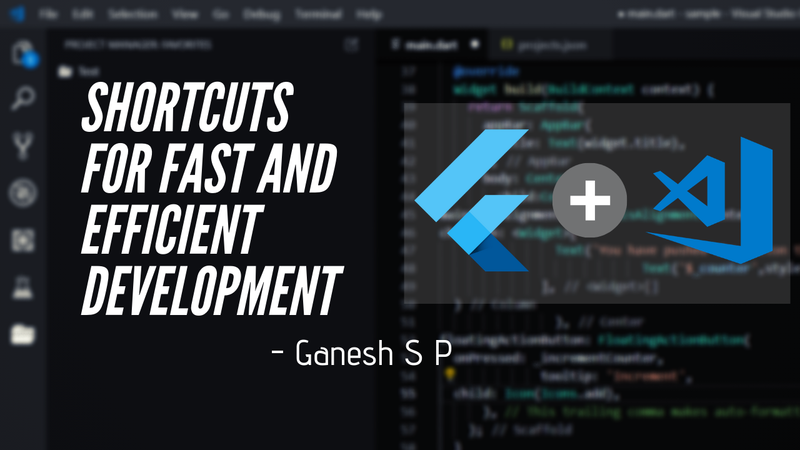 I hope I have covered all the shortcuts which I could find and thought are mostly useful, follow me for more tips, tricks and flutter stuff.There are a ton more shortcuts or tips if you are using extensions and I will cover that in a different article so stay tuned 😉. 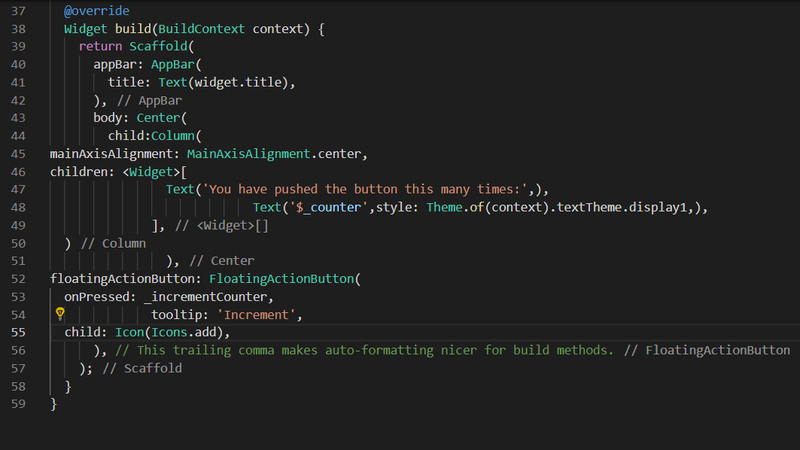 If you have any other shortcuts or tips for Visual Studio code, feel free to comment below and let me know. If you liked this article, please support me by clapping your hands👏 as many times as you can.Psst… you can go up to 50 times and I would be more motivated to bring more such articles in the future. Hi, I am Ganesh S P. An experienced Java developer, extensive creative thinker and an entrepreneur and a speaker, now venturing into the world of Flutter. You can find me on LinkedIn or in github or follow me in twitter. In my free time I am a content creator at GadgetKada. You could also mail me at ganesh.sp006@gmail.com to talk anything about tech.